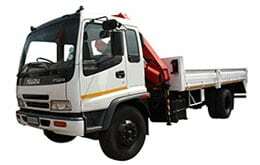 Power Truck Hire offers Crane Truck Hire as a specialised service. We stock a wide range of crane trucks in our fleet that are available with various lifting and load capacities that range between 8 and 14 ton. The crane lifting capacities range between 3 and 6 tons. The capacity of the crane truck that is hired through Power Truck Hire is determined by mass and volume of the cargo. In addition, the truck is supplied along with an experienced driver/crane operator. Please note that our vehicles are rented out on a daily, weekly and a monthly basis. Having the flexibility of a short term rental is ideal for once off jobs that have to be completed. For more information about crane truck hire or to request a quote, please contact us! For more information about crane truck hire, please phone us on 0861 44 55 44 or email us at info@powertruckhire.co.za.